The beach at the Cap Juluca resort on Maundays Bay, Anguilla. Destination Anguilla, a virtual guide to the island in the British West Indies. Beeing one of the Lesser Antilles islands, Anguilla is the northernmost of the Leeward Islands, located about 270 km (165 mi) east of Puerto Rico, and just north of the island of Saint Martin, in the Eastern Caribbean. 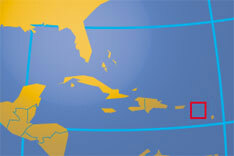 The island shares also maritime borders with Antigua and Barbuda and the U.S. Virgin Islands. Formerly a British colony and briefly united with St. Kitts and Nevis in 1967, it is now a self-governing dependency of the UK. The territory consists of the main island of Anguilla and a number of uninhabited smaller islands and cays. With an area of 91 km² the island is slightly larger than half the size of Liechtenstein or about one-half the size of Washington, DC. Capital and seat of the Governor's Office is a town known as The Valley. Spoken language is English. Anguilla is served by Clayton J. Lloyd International Airport (formerly Wallblake Airport). Nearest international airport is Princess Juliana International Airport on the neighboring island of Saint Martin (St. Maarten). Originally inhabited by Arawak and Carib peoples, Anguilla became a British colony after English settlers arrived in 1650. Its people are of mainly African descent. Anguilla, as the first in the chain of the Leeward islands, is located in the Eastern Caribbean, east of Puerto Rico and the Virgin Islands. It is only a few minutes by air from the major international airport of St. Maarten and is serviced by regular flights from the other international Caribbean gateways of Antigua and Puerto Rico. Anguilla's location, and its reputation as a friendly and virtually crime free society, has enabled it to establish itself as a high end tourist destination. Type: Internally self-governing British overseas territory. Head of State: Her Majesty Queen Elizabeth II, represented by the Governor. Location: Eastern Caribbean, east of Puerto Rico and the Virgin Islands. Terrain: Flat limestone and coral island with only a few rolling hills. Climate: Tropical; moderated by trade winds. Natural resources: Salt, fish, lobster. Agriculture products: Tobacco, vegetables; cattle raising. Industries: Tourism, boat building, offshore financial services. Exports - commodities: lobster, fish, livestock, salt, concrete blocks, rum. Imports - commodities: fuels, foodstuffs, manufactures, chemicals, trucks, textiles. The government of the British Overseas Territory is an internally self-governing dependency with a multi party system and an unicameral parliament (House of Assembly). Head of government is the Chief Minister. The Governor, is the representative of Her Majesty the Queen and the Constitutional Head of State in Anguilla. The Governor presides the Executive Council and is responsible for foreign affairs, defence and the civil service. Official site of the Government of Anguilla. Site provides information on immigration laws and policy. The British Government department responsible for overseas relations and foreign affairs. Address list of UK Embassies Abroad. Searchable map/satellite view of Anguilla. Searchable map/satellite view of Anguilla's capital city. Political Map of the Caribbean. Anguilla's (Official) Channel for greater Communications. Anguilla gossip and news online. "The Voice of Choice", with local news. Learn more about Anguilla's culture and history, article by the Anguilla Tourist Board. Teresa Harrigan one of Anguilla's best young adult artist. Anguilla has few natural resources, and the economy depends heavily on luxury tourism, offshore banking, lobster fishing, and remittances from emigrants. The Government of Anguilla is keen to develop a thriving, high quality financial services sector in Anguilla. The National Bank of Anguilla online. Anguilla Financial Services, Includes ACORN, Anguilla's Commercial Online Registration Network, by which companies can be registered. The official web site with information about the Chamber's role and activities in Anguilla. Online guide to products and services. Link Ferries operate between Anguilla and St. Martin. Discover Anguilla: tranquility, wrapped in blue. The Valley, Scrub Island, West End, Road Bay, Shoal Bay. Gorgeous Beaches, Luxury Accommodations, Five-Star Resorts, Watersports, Festivals, Events and much more. The Official site of the Anguilla Tourist Board. Lloyd's Guest House is located in the center of Anguilla. Education in Anguilla: Is free and compulsory between the ages of five and seventeen. There is one state comprehensive school, six state primary schools and five day care centres for children under the age of five. ANT was established to act as custodian of Anguilla's heritage, preserving and promoting the island's natural environment and its archaeological, historical and cultural resources for present and future generations. An image guide to Anguilla's gardens. UKOTCF promotes conservation of plant and animal species and natural habitats of UK Overseas Territories. Anguilla's Tourist Board Page about Anguilla's long rich history. Wikipedia article about the history of the island. Online guide to Anguilla related sites. Index of Anguilla web links.